The Bureau of Reclamation (Reclamation) has jurisdiction over more than 8 million acres of land in the 17 Western States. Many people recognize the role of the agency in providing water for irrigation and other uses, but few are aware of the many and diverse cultural resources that the agency also manages. Prehistoric and historic archaeological sites, engineering structures, buildings, and even museum objects are counted among Reclamation's cultural resources. As the steward of these resources, Reclamation works to protect and preserve them for their true owners-the American people. The majority of cultural resources identified on Reclamation lands are archaeological sites, and most of these are prehistoric. The material remains of past human life and activities range in age from at least 12,000 years before present through historic-era, non-Indian occupation and use of the landscape. 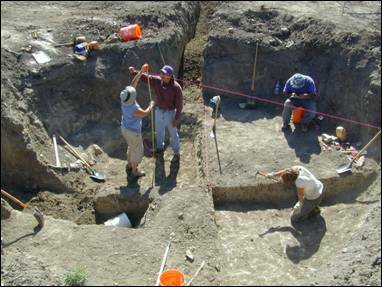 Since much of Reclamation's land is located close to rivers and streams where human populations tended to concentrate in prehistoric times, a wealth of archaeological sites are present. Among the properties identified are prehistoric villages and campsites; game drive, kill, and processing sites; lithic quarries; cemeteries and sacred sites; and traditional plant gathering and fishing sites. To date, about 14,000 archaeological sites have been inventoried on Reclamation land. 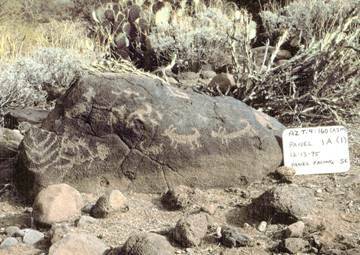 Mitigation of archaeological resources for the enormous, ongoing Central Arizona Project changed Hohokam archaeology, and revealed new insights about the Hohokam and neighboring prehistoric peoples. Archaeologists have conducted investigations at sites ranging from small artifact scatters to a 60-acre village. 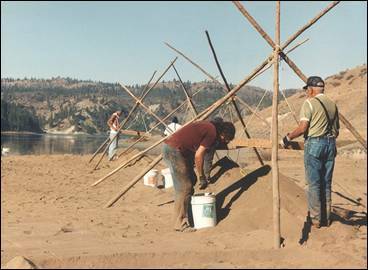 Since the 1970s, over 5,500 sites have been identified by Reclamation archaeologists and contractors, including universities and Native American tribal archaeology programs. Currently, the Animas-La Plata archaeological project in southwest Colorado and northwest New Mexico is the focus of Reclamation's major survey and data recovery efforts. The multi-year project in the Colorado portion is administered by the Ute Mountain Ute Tribe under a cooperative agreement with Reclamation. There are over 200 known archaeological sites in the project area, and Reclamation has completed conducting data recovery on approximately 75 sites. They primarily date from the Pueblo I Period (AD 700-900). The Navajo Nation is also an archaeological contractor for the New Mexico portion of the project. In the Pacific Northwest, Lake Roosevelt comprises a section of the Columbia River that was once a major population and trading center for many American Indian tribes. Since the early 1990s, Reclamation, in cooperation with the Bonneville Power Administration and the National Park Service, has been implementing extensive and intensive investigations at Lake Franklin D. Roosevelt in Washington to identify and address the effects of ongoing reservoir operations on archaeological sites. All Federal lands exposed during low-water intervals have been inventoried. Test excavations to assess significance and integrity of historic properties are underway. The agencies currently contract with the Confederated Tribes of the Colville Reservation and the Spokane Tribe of Indians for these investigations and for Traditional Cultural Properties research. Important and endangered sites are being monitored for erosion, and several have undergone stabilization or data recovery. Because of Reclamation's role as a water development agency, historic structures on its lands are primarily engineering works that reflect Reclamation's prominence in the design and construction of dams and irrigation systems since 1902. Reclamation dams and power plants can be found on river systems throughout the West. Thousands of miles of Reclamation irrigation canals and laterals provide water for agricultural use. As such, many of Reclamation's historic structures are found in relatively remote or non-urbanized locations. A number of these properties are listed in the National Register of Historic Places . 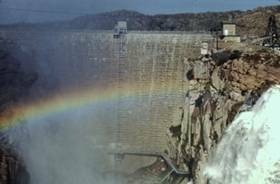 Among Reclamation's best known engineering achievements are Hoover Dam, Grand Coulee Dam, and Shasta Dam. 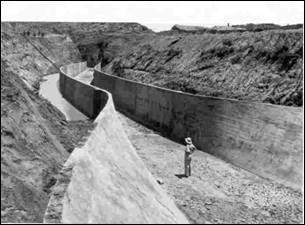 Pathfinder Dam in Wyoming is a key feature of the North Platte Project, one of the first five projects authorized for construction following passage of the Reclamation Act of 1902. The dam is listed in the National Register of Historic Places. As the number of Reclamation-built facilities reaching 50 years of age increases (133 out of 178 major Reclamation projects were authorized prior to 1955), so does the documentation of the agency's historic structures. A number of historic Reclamation irrigation projects have been extensively researched and documented. These include the Yuma Project in Arizona and California, the W.C. Austin Project in Oklahoma, the Milk River and Sun River Projects in Montana, the Lower Yellowstone Project in Montana , and the Yakima Project in Washington. In comparison to the vast network of engineering structures built by Reclamation, the number and scale of its buildings are small. They were constructed either by Reclamation in association with its projects, or already existed on lands acquired for project development. Examples of the former include offices, construction camps, maintenance quarters, and damtenders' and ditchriders' houses. Types of preexisting historic buildings on Reclamation lands include ranch and farm complexes, and even entire communities. In some cases, during construction of reservoirs, buildings or entire communities were relocated. The submerged remains of the original town of American Falls, Idaho, are located in the reservoir behind American Falls Dam. 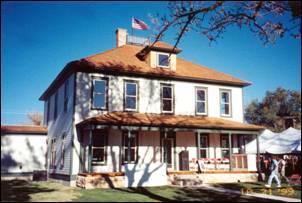 A preservation success occurred on March 13, 2006, when Reclamation’s historic Boise Project Office was transferred to the Idaho State Historical Society. In the summer of 2003, Reclamation moved out of the building located at 214 Broadway in Boise because of the need for additional space. Since then, the vacant building’s future had been uncertain. The Boise Project Office was completed in 1912 and originally served as the headquarters for Reclamation’s Boise Irrigation Project. The two-story structure is one of the oldest surviving Reclamation office buildings and is unusual for its size, use of brick, and Craftsman style detailing. The building possesses an exceptional level of integrity, both interior and exterior. The Idaho State Historical Society will ensure that the historic integrity of this important building is maintained. The 19. Uncompahgre Project office building in Montrose, Colorado, has served as the headquarters for Reclamation's 19. Uncompahgre Project since completion in 1905. Rehabilitated in the mid-1990s, the building is listed in the National Register of Historic Places. The damtender's house at Pathfinder Dam in Natrona County, Wyoming, was constructed out of the same stone as the dam. Because of the great distance of the dam from any town, it was necessary to have a damtender live onsite to oversee operation of the dam. 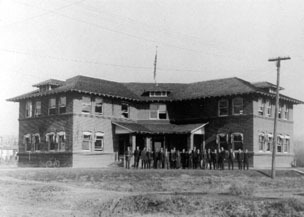 This historic photo shows the residence shortly after completion in 1906. The building is now used as a small museum to tell the story of the dam. A unique category of Reclamation buildings and structures were those constructed by the Civilian Conservation Corps (CCC) at several reservoirs including Elephant Butte in New Mexico, Lake Guernsey in Wyoming, and Lake Minatare in Nebraska. 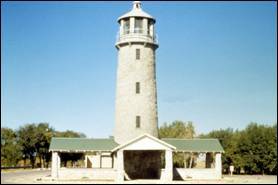 Included among the CCC works are tourist cabins at Elephant Butte Reservoir, picnic shelters and a museum at Lake Guernsey, and this unusual "lighthouse" lookout tower at Lake Minatare. 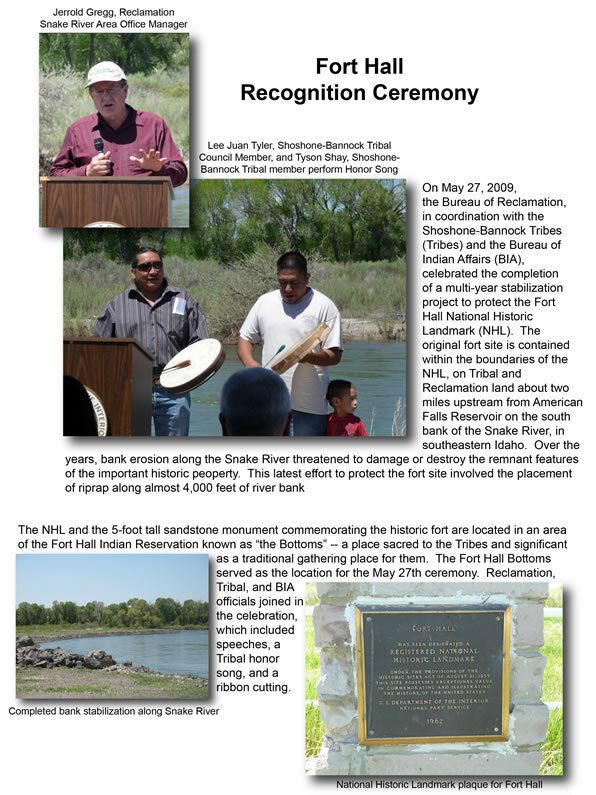 At a ceremony on May 17, 2009, in Virginia City, Nevada, the Bureau of Reclamation’s Lower Colorado Dams Office was among several groups and individuals recognized by the Nevada State Historic Preservation Office as part of the celebration of Archaeological Awareness and Historic Preservation Month. Reclamation received a commendation for its sensitive rehabilitation of the historic Exhibit Building at Hoover Dam. 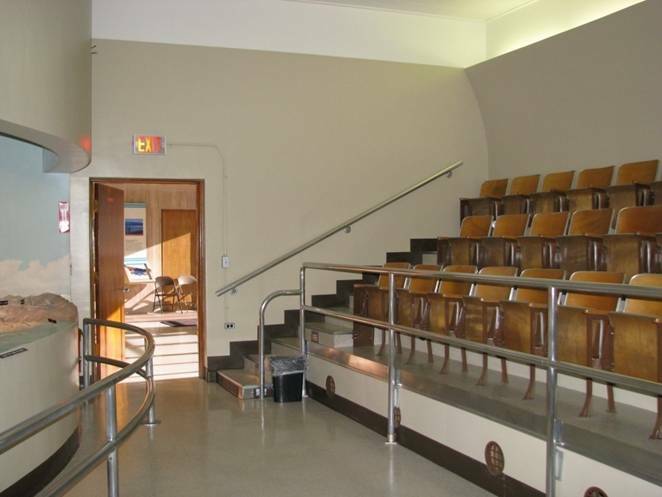 Constructed between 1940 and 1946, the small building contains an 85-seat auditorium that originally offered visitors an opportunity to view a model of the Colorado River and listen to a 10-minute taped lecture. 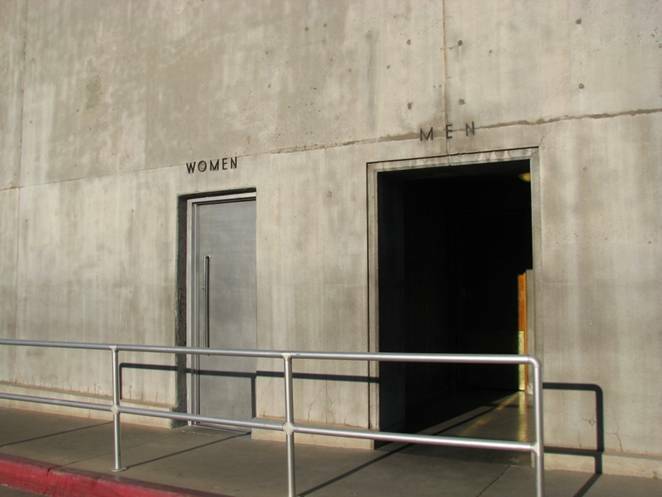 Today, the Exhibit Building is one of the stops on the Hoover Dam Tour. Visitors can still view the model and gather in the renovated auditorium for a presentation on Reclamation’s operation of the Colorado River system. Funding from the Southern Nevada Public Lands Management Act made the rehabilitation possible. Reclamation contracted with Spectra, Inc. to perform the construction. 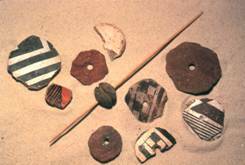 Reclamation has ownership of a significant collection of artifacts derived from archaeological excavations conducted on its lands. These comprise a majority of the agency's 8.6 million objects of museum property. Also included are historic objects, artwork, fossils, documents, and ethnographic items. Reclamation's cultural resources are unique and irreplaceable. They connect us to events and people of the past. When cultural resources are lost through development, erosion, vandalism, or natural disasters, the information they contain is lost forever. Reclamation strives to protect significant cultural resources from adverse impacts. When this is not possible, information on the resources is captured through research, documentation, interpretation, or sometimes, when archaeological sites are involved, through excavation. The past belongs to all of us. People who deface or loot prehistoric or historic sites on Federal lands, disturb Indian burials, or buy/sell burial artifacts and human remains can be fined or imprisoned under the Archaeological Resources Protection Act or Native American Graves Protection and Repatriation Act. Treat historic and archaeological sites with care and respect when you visit. Take only with your eyes and heart; leave sites intact for your children's children. If you see someone vandalizing or looting a site, notify the Federal land managing agency or your local law enforcement office. Do not attempt to confront the vandal yourself. Volunteer! Join your local or State archaeological or historical society. Many of them offer a variety of volunteer opportunities. Various Federal agencies also have programs for volunteers interested in archaeology and historic preservation. Contact the Reclamation cultural resources staff in your area to find out about possible volunteer activities. Check out Passport in Time and Participate in Archaeology. Contact Joseph Giliberti for comments, feedback, or questions. For site problems, please contact Reggie Lott.